Here is a very timely story about the traffic downtown and the link to the Verrazano Bridge toll. The story was published in 1998, but it is still very relevant. JAMMING; The Traffic Downtown Seems Worse Than Ever. Is the Verrazano the Villain? IT'S another weekday afternoon rush hour in lower Manhattan, and Canal Street is gridlocked. Eastbound lanes are clogged with cars, trucks and buses headed for the Manhattan Bridge. Westbound lanes are choked with vehicles aiming for the Holland Tunnel. On northbound and southbound arteries -- Hudson and Varick Streets, the West Side Highway, even Broadway -- traffic has congealed into a horn-honking, sputtering mass. It's no better on the narrow side streets that lead to the tunnel, like Broome, Watts and Spring. Every so often when there is a break in the jam, motorists hurtle through the intersections, ignoring pedestrians trying to cross. They scurry for safety even when they have the light. ''I've almost been hit twice,'' said Fred Parvin, who lives in the neighborhood. His wife, Mary Parvin, said she closed her eyes and prayed before crossing Canal Street. ''It was probably easier getting across the Berlin Wall,'' she said. But drivers in the Canal Street corridor rarely get to speed for long. Many of them will spend as much as an hour trying to get out of Manhattan. Many of them will curse and whine. So what else is new? Plenty. Traffic in both directions through the Holland Tunnel increased by 25 percent between 1986 and 1996, the most recent city figures show, while declining slightly at Manhattan's other Hudson River crossings. Downtown, the traffic situation has gotten so bad that the Transit Authority is planning to change the M-10 bus route to avoid Canal Street, much to the dismay of residents and local officials. And things are likely to get worse. A state plan to add six lanes to the existing eight at Canal Street's intersection with the West Side Highway would dump even more cars on the street. This month, furious residents filed suit in an effort to block the plan. Others in the neighborhood think the timing is right for another approach to ending the downtown traffic nightmare. For there is something else that is new: Senator Alfonse M. D'Amato will soon be out of office. Traffic in this city is as much about politics as it is about cars, buses and trucks, and memories can be long and unforgiving. To this day, many people in Brooklyn and Manhattan argue that some of their worst traffic woes stem from the so-called one-way toll over the Verrazano-Narrows Bridge. That toll was a result of Federal legislation championed in 1986 by Guy V. Molinari, then a Republican member of Congress from Staten Island, a G.O.P. stronghold, and Senator D'Amato, who is also a Republican. Devised to appease Staten Island residents who complained about long lines at the toll plazas on the way to Brooklyn, the one-way toll into Staten Island at a round-trip price alleviated traffic congestion there. But Brooklyn and Manhattan residents claimed that it encouraged New Jersey-bound drivers, especially truckers, to use their streets and the westbound Holland Tunnel, where there is no toll, in order to avoid paying the Verrazano toll. For 12 years, they have been stewing as one-way-toll supporters, especially Senator D'Amato, have outmaneuvered them in maintaining what was originally supposed to be a six-month experiment. Now that he has been defeated by Charles Schumer, it looks like the battle of the Verrazano is about to be waged once again. ''I am certainly going to make an attempt to repeal that law,'' said Representative Jerrold Nadler, whose district includes parts of lower Manhattan and Brooklyn. He said the toll should not be a Federal matter. City Councilwoman Kathryn Freed, who represents TriBeCa and SoHo, also maintains that it's time to get rid of the one-way toll, which she says has led to increased traffic on Canal Street. And that traffic, she said, poses a danger to residents. There are still powerful supporters of the one-way toll, like Mayor Giuliani and Mr. Molinari, the Staten Island Borough President, who maintains that a return to the two-way toll would create ''a real mess on Staten Island without much of an effect on Manhattan.'' But with Mr. D'Amato's defeat last month by Mr. Schumer, the Representative from Brooklyn, who has opposed the one-way toll, the balance of power on this issue among New York politicians may have shifted. Or maybe not. At this point, it is not clear where Senator-elect Schumer stands on the issue of the one-way toll. An article in The Staten Island Advance just after the election reported that he had promised not to roll it back. But Mr. Schumer did not return numerous calls seeking comment on the matter. Neither did Mr. D'Amato. Whatever position Mr. Schumer does take, the numbers clearly point to more traffic and more congestion downtown. An average of 96,798 vehicles a day passed through the Holland Tunnel in one or the other direction in 1996, compared with 77,300 a decade earlier, according to the latest figures from the city. More vehicles left Manhattan by the Holland Tunnel (50,110 a day) than entered by it (46,688 a day). And there were more motorists taking a free ride out of Staten Island on the Verrazano bridge (96,523 a day) than paying the toll to cross over the Narrows (88,034 a day). But is all, or any, of that because of the one-way toll? Nobody knows for sure. 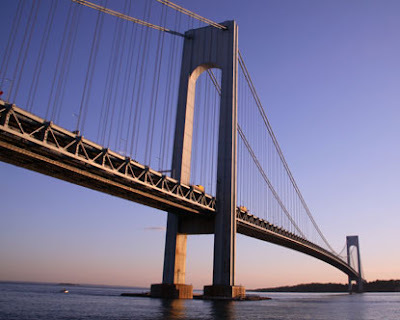 Yet for many, the one-way Verrazano toll remains the villain. The Verrazano-Narrows Bridge, conceived by Robert Moses as a tunnel crossing to allow users of his highway and parkway system to bypass Manhattan and downtown Brooklyn in their travels between New England and New Jersey, also helped promote growth on Staten Island. Since the bridge opened in 1964, the borough's population has increased from around 250,000 in the mid-1960's to more than 400,000 in 1997, when the most recent census estimates were done. And as the number of people living on Staten Island increased so did the number of vehicles that crossed the bridge, which amounted to more than 150,000 by 1984. To address the problem of large-scale traffic jams on the Staten Island side of the bridge, the Metropolitan Transportation Authority considered one-way-toll collection in 1984. But that plan was abandoned after an agency study concluded that the change would result in the diversion of 7,000 cars and trucks a day to the Holland and Lincoln Tunnels in Manhattan, causing traffic jams there as well as increases in air pollution and an annual toll revenue loss of nearly $8 million. The reason? Motorists traveling from Brooklyn to New Jersey would have to pay a double toll under the one-way system if they traveled through Staten Island. But if instead they used one of the free, lower Manhattan East River crossings and then took the Holland Tunnel, they would pay nothing, since Holland Tunnel tolls were, then as now, collected only in the New York-bound direction. Undaunted, then-Representative Molinari, a member of the House Transportation Committee, took the idea of a one-way toll to Washington. In 1985 he had a measure tacked on to an appropriations bill that would deny New York highway financing if it did not try the one-way toll for six months. After that, the Governor of New York would be free to petition the Federal Government for relief on environmental or revenue grounds. Despite strong opposition from state and city officials, who complained about Federal meddling in local affairs, the bill was shepherded through the Senate by Senator D'Amato and signed into law in December 1985. The reaction outside Staten Island was swift. A week after the toll was made one-way, the Brooklyn Borough President, Howard Golden, sued the M.T.A., arguing that the toll change should not have been made without an environmental impact study. Members of the SoHo Alliance, a downtown Manhattan group, joined the suit. In June 1986, a State Supreme Court Justice in Brooklyn, Franklin W. Morton Jr., ordered an environmental study. But he did not stop the toll collection. Brian Ketcham, an engineer who analyzes traffic for civic groups and government agencies, said the impact on Canal Street was immediately obvious. At the time, he recalled earlier this month, he was surveying traffic for the proposed SoHo Grand Hotel, which was later built on the corner of West Broadway and Grand Street, a block north of Canal Street. ''We saw all these trucks that we had not seen before, stopped on Canal Street,'' he said. ''So we went and asked them what they were doing, and they told us that they had decided to save the toll and come into Manhattan.'' At the time, one-way truck tolls on the Verrazano ranged from about $20 to $25. Now they start at around $30. For cars, the regular toll is now $7 but there are discounts for Staten Island residents and for people who use the E-Z Pass electronic toll collection system. Under pressure from local Democrats -- including Mr. Schumer, who was in Congress then -- the House of Representatives voted in 1986 to rescind the one-way toll. All the members of the New York delegation, except for Mr. Molinari, supported the measure. But Senator D'Amato threatened to block an appropriations bill in the Senate, and the repeal was abandoned. Six months passed, and the one-way toll law lapsed. But no change could be made because of the court ruling that required an environmental impact study first. Finally, in 1987, the state finished the study. Like the earlier one by the M.T.A., it found that the one-way toll would lead to increases in traffic and pollution in Brooklyn and Manhattan and a drop in toll revenues. Mario Cuomo, then the Governor, petitioned for the lifting of the one-way toll, and in 1988 the Federal Government agreed. Still, the toll remained. The M.T.A. said it needed to do yet another environmental impact study before deciding what kind of toll to impose instead. That took until 1993, when an inconclusive report -- widely criticized by one-way-toll opponents -- was issued after contentious hearings on both sides of the Narrows. By then, Susan Molinari, who succeeded her father as Staten Island's Representative in Congress, had begun sponsoring measures that kept the one-way toll going a year at a time. Despite the opposition of other members of the city's Congressional delegation, these passed as riders or amendments to larger bills with the assistance of Senator D'Amato. After five years of this, Congress in 1995 passed a permanent extension of the one-way-toll law as part of the National Highway System Designation Act, which also eliminated the mandatory 55 mile per hour speed limit and provided money for public transit and redevelopment of Penn Station. Only an act of Congress can get rid of the one-way toll. And in arming themselves for their next battle, both sides will have one problem in common: traffic data. Among the facts, there are many variables and inconsistencies. Over the last decade, for example, the economy has gone up and down and up again. Tolls all over the metropolitan region have been raised, and, starting in 1995, E-Z-Pass was introduced. Highways and bridges have closed for repairs, requiring detours. And national driving trends suggest that people are pushing pedal to the metal like never before. All of these factors have surely had an effect on traffic in New York. But how? And where? Huge amounts of data are collected about traffic, much of it under the aegis of the New York Metropolitan Transportation Council, the main planning body for the region, whose members include the State Department of Transportation, the City Department of Transportation, the Port Authority and the Metropolitan Transportation Authority. But these agencies, which gather various types of information, often don't measure things the same way. But one thing is clear from the data. Notwithstanding the recent highly touted increases in public transit ridership, people are driving into New York City at least as much today as ever before. According to the city's Department of Transportation, 1,768,742 vehicles traveled between Manhattan, the other boroughs and New Jersey on an average weekday in 1996, roughly as many as in 1986, when the all-time record was set. More recent figures point to a sharp increase in that number. In 1997, the Metropolitan Transportation Council reported that 100,000 additional vehicles a day were using the bridges and tunnels of the metropolitan area, most of them in New York City, compared with the previous year. There was more traffic on the George Washington Bridge, the 59th Street Bridge and the Williamsburg, Brooklyn and Manhattan Bridges, as well as through the Lincoln Tunnel, the Queens-Midtown Tunnel, and, yes, the Holland Tunnel. How many of the vehicles using the Holland Tunnel are trucks, the nemesis of many downtown Manhattan residents? The Transportation Council counted a total of 5,287 for 1997, but it got that number by simply doubling average truck volume in the Manhattan-bound, toll direction. Trucks heading west, to New Jersey, aren't counted, said Greg Trevor, a spokesman for the Port Authority, which operates the tunnel. And what of technology? Haven't toll-booth lines been noticeably shortened since the EZ-Pass was introduced? Is it possible that motorists on the Verrazano could glide through two-way tolls in a way that was unimaginable back in 1986? The answer is maybe. Although the Triborough Bridge and Tunnel Authority keeps track of how many vehicles use EZ-Pass -- nearly two-thirds of those going over the Verrazano Bridge in September did, for example -- it has no figures on the typical lengths of lines or waiting times at the toll booths. ''We do know anecdotally that the queues are much shorter'' at all toll booths, said a spokesman for the Bridge and Tunnel Authority, Frank Pascual, but that's about it. Back on Canal Street, the horns honk, the pedestrians dodge, the drivers curse. City police officers divide the area's streets into bus lanes, tunnel access lanes and through lanes, although this helps only a little, said Peter Pennicka, the chief of planning for the city's Transportation Department. Meanwhile, traffic-weary residents and their representatives demand that something be done. As any New Yorker will tell you, it's not just the traffic that drives people in this city to distraction. There's the noise, too, and the wear and tear on the streets. Not to mention the pollution. Richard Kassel, a senior attorney at the Natural Resources Defense Council in Manhattan, said New York has two major air quality problems, both related to vehicle exhaust. One of them, excess ozone, is common in cities nationwide. But the other, particulate pollution -- pollution caused by microscopic particles of dirt in the air -- is pretty much a New York phenomenon, Mr. Kassel said. ''Manhattan has the highest particulate levels of any place east of the Mississippi,'' he said, ''and it's almost entirely due to diesel trucks and buses and the tall buildings that trap their fumes.'' Particulates are not the soot that people can see on windowsills, he said, but smaller bits of dirt that are invisible to the eye. They are by far the more dangerous, he said, because the human body has no defenses to keep them from entering the respiratory tract. New Federal standards regulate emissions of particles smaller than 2.5 microns: one-seventieth the diameter of a human hair. But 90 percent of diesel particulates, which can contain as many as 40 known human carcinogens, are actually under one micron in size, Mr. Kassel said. To address the problem, New York State recently announced plans to add 268 clean-fuel buses to the city's fleet. It will also begin emission testing for diesel trucks and buses next June. But the tests will not necessarily detect particulates smaller than one micron, said Jim Ralston, director of air quality planning for the New York State Department of Environmental Conservation. Mr. Ralston said that newer, more sensitive tests were being developed.